Seafood recipes of South India especially Kerala are the one that needs no introduction. Today lets go for a scrumptious ride to Kerala dishes. A spicy lip smacking shrimp recipe. Kerala recipes specially shrimp recipes(seafood recipe) are very popular in taste and spiciness. This recipe for pepper shrimp is considered as one of the traditional dishes of Kerala, South India. A fantastic quick and simple recipes with shrimp which is well flavored with pepper and other spices. Prawns are marinated in beautiful kerala spices and lemon juice . Here the marinated shrimp /prawns are cooked in that shrimp marinade , then fried in coconut oil along with sauteed onion and fine aroma of curry leaves. Kerala is known as the land of spices as it has the perfect climate to support the cultivation of spices like pepper, cardamom, cinnamon, cloves, nutmeg, turmeric etc. More over they use coconut oil for cooking which which gives a distinct taste to all Kerala dishes. Besides enhancing the taste of the dish, it blends and tones down the potency of spices. Kerala style Chemmeen kurumulaku varattiyath / chemmeen kurumulaku fry tastes fantastic with these kerala spices. 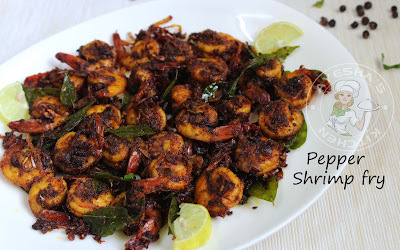 Lets move on to the recipe of Kerala style pepper prawns / chemmeen kurumulakittath / konju fry. 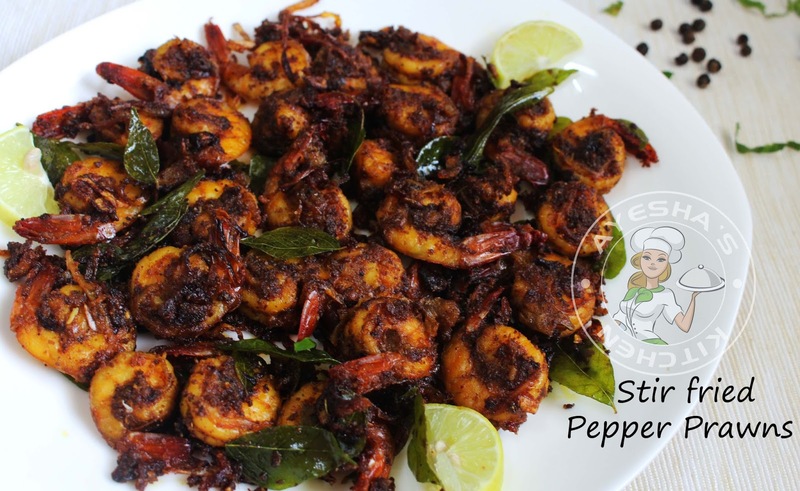 Here is the recipe showing how to make pepper shrimp recipe / kurumulaku chemmeen roast / South Indian stir fried shrimp recipes / shrimp recipes with rice / fresh seafood fry. Do try this spicy prawns fry along with your dinner meal or lunch meal. Marinate the cleaned prawns / shrimps with turmeric powder, kashmir chili powder, coriander powder, ginger garlic paste, pepper powder (1 tsp), salt and lemon juice. Rub it well and set aside for few minutes. Now heat a wok along with this marinated prawns and quarter cup of water. Cook until the all the water gets dried out and prawns go dry. When done off the flame. Now heat a non stick pan with coconut oil and saute the sliced onion, green chilies and curry leaves until translucent. To this,add the cooked prawns along with 1 tsp of pepper powder. Saute occasionally. Cook for 8 minutes over a medium flame or until the prawns get fried well and well coated with the spicy masala.. Serve hot as a side dish along with steamed rice or dosa.